My four year old niece is coming to stay with us for a week while her mom and dad are away. I'm excited to have her come and I hope that she'll still think I'm cool even though I have hardly any fun kid stuff at my house! I'm a little nervous about how I'll keep a four year old entertained for seven days. I definitely want to take my niece to the library (my favorite place). But the more I think about it, the more I realize that I don't have a good sense of which books to check out for her! I read lots of young adult books, some grown up books, and some children's books, but I know that my niece's reading level isn't as flexible as mine. I'll probably look for the Olivia books by Ian Falconer (I ♥ Olivia!). But what other books are not too simple and not too complicated for a pre-schooler? What books do the four-year-olds you know like to read? Hey. My four year old also loves Olivia. She is currently into "learn to read" books. They have simple words she can sound out. If I am reading her a book than she will listen to almost anything. We are reading short chapter books now, like Curious George or Honey Bear. We are also into puzzles and dress up. Have fun! I would take her to the library, so that you can start to read some books that may be of interest to her, before you check them out and find she's bored. 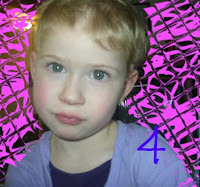 ...this is no ordinary little 4-year-old. Good luck! Thanks! I'm glad to know Olivia is a good place to start. I think we're going to the library on Tues or Wed - they'll all be closed on Monday (Memorial Day). I guess we'll take it from there. I know this is a bit late, but I just like to get what my son is interested in. Even if it's way beyond his level, I "edit" it as I read so he understands. I did end up doing a lot of editing - mostly because she wasn't usually interested in listening to the words.